Global demand for decorative laminates is expected to rise 5.6 percent per year to 10.7 billion square meters in 2018, valued at $40.8 billion. The Asia/Pacific region will dominate demand and be the fastest growing market, based on its leading position in engineered wood production, which is often given a laminate layer. 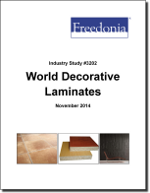 This study analyzes the 8.1 billion square meter world decorative laminates industry. It presents historical demand data (2003, 2008, 2013) and forecasts (2018, 2023) by product (low-pressure laminates, high-pressure laminates), market (e.g., furniture, cabinets, flooring, wall panels), world region, and for 20 countries. The study also considers market environment factors, details industry structure, evaluates company market share and profiles 40 industry players, including Wilsonart International, Fletcher Building and Broadview Holding.